It has been a little over a year since my father passed away. I miss him every day, the hard grief that you feel for months where you want to roll up in a ball and hide from the world and cry, passed during the first few months. At least I always think it has passed. It pops back up every now and then, however, I can usually move past the tears and sadness after a few moments. Today I had a moment that turned into ten minutes, then twenty, then a half an hour of tears. It was brought on a beautiful song that was playing on the radio and me driving in a torrential down pour at the same time. Probably not the safest place to lose control over your emotions! The song that I had chosen to be played at my dad’s funeral, “If I could only Imagine” by the group Mercy Me and also one of my all time favorite songs. I thought about the song and the meaning behind it and how someday all this pain will not matter. All this grief that sneaks up on me, all the pain others cause, all the hate in the world will be gone and One day I will be standing before Jesus- and then and only then will all pain and tears be gone. I am sure the black sheep of emotions, i.e. Grief will wiggle its way back because I do miss a part of my life that is no longer there. I will however survive and move on and I will rest in the assurance that my Hope is in Christ and for that I will be grateful. I posted the lyrics to the song and the video so I hope you enjoy it and I hope you don’t start a blubbering— well yes, I really do secretly hope you get emotional! 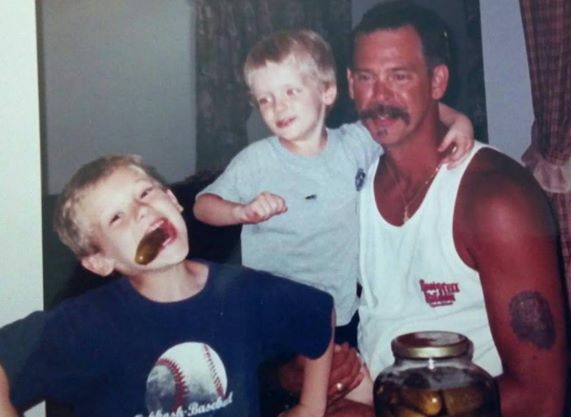 This is a picture of my father and my boys when my kiddos were younger and didn’t mind the camera! This song still makes me think about my dad every time I hear it and I am thankful for that, I know it has been years since he has passed now, but it has only been a short time he has been in the presence of Jesus.